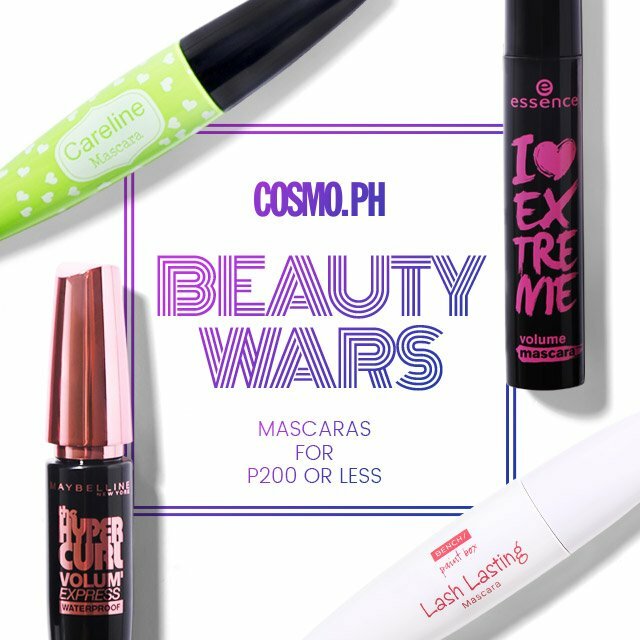 Are there cheap but high-quality mascaras you can buy in the Philippines? Cheap or affordable doesn't necessarily mean a product won't deliver results. This product roundup will prove that you don't have to spend a ton of money to get amazing lashes! We give you the lowdown on super affordable mascaras from Careline, Bench, Essence, and Maybelline—all available in most drugstores in the Philippines. What It Is: This mascara is equipped with a plastic bristle brush to curl, volumize, and lengthen every lash without the clumps. Why We Love It: Great for every day! We didn't find anything *special* about it, but that's what made us love it—our lashes looked "natural but better." If you're someone whose lashes easily droop down, though, we suggest using waterproof mascara underneath and layering this on top. What It Is: Volumizing and lengthening, this waterproof mascara will give you full and fluttery lashes in an instant! Why We Love It: Bench continues to impress us! This formula held a curl really well and gave our lashes volume and extra length. Where have you been all our life?! What It Is: With extra black pigments and a larger-than-life brush, this mascara will ensure your lashes look thick and dark without irritating your eyes! Why We Love It: Essence's mascara gave volume without making our lashes look clumpy or spidery. Even with multiple layers on, it didn't feel heavy at all! What It Is: A waterproof and non-irritating mascara that will keep your lashes looking natural, soft, and curled for up to 24 hours. Why We Love It: Works exactly like the Bench mascara, but what made it holy grail material for us was its brush: Its angle and size are perfect for all eye shapes, so we never got mascara goop all over our lids and we were able to coat every lash on the inner corners of our eyes!